يشكل فندق Trickett Gardens Holiday Inn بموقعه الممتاز في منطقة تسوق, شواطئ, الحياة الليلية ضمن المدينة، مكاناً ملائماً لقضاء العطلة بعيداً عن عجقة أيام العمل. يمكن من هنا للضيوف الاستمتاع بسهولة الوصول إلى كل ما تقدمه هذه المدينة النابضة بالحياة. إن سهولة الوصول من الفندق إلى المعالم السياحية الشهيرة الكثيرة في المدينة هو استثنائي بحد ذاته. استمتع بالخدمات الراقية والضيافة التي لا مثيل لها بهذا الفندق في هذه المدينة رائعة الجمال. تتضمن الميزات الرئيسية في هذا الفندق: واي فاي مجاني في جميع الغرف, خدمة حجز التذاكر, تخزين الأمتعة, واي فاي في المناطق العامة, صف السيارات. تنعكس أجواء Trickett Gardens Holiday Inn في غرف الضيوف.تلفزيون بشاشة مسطحة, مكيف هواء, تدفئة, مكتب, ميني بار هي بعض الميزات الموجود في العديد من الغرف. سواء كنت من محبي الرياضة أو كنت تتطلع لتفريغ عناء نهار صعب، ستجد خدمات ذات مستوى عالي بانتظارك كمثل حوض استحمام ساخن, مسار جولف - ضمن 3 كم, حمام سباحة خارجي, سبا, حديقة. مهما كانت أسبابك لزيارة المدينة، فإن Trickett Gardens Holiday Inn هو الخيار الأفضل لإقامة مثيرة وممتعة. يتوفر 60 لترًا من الماء الساخن في كل نوع غرف ويستغرق الأمر 30 دقيقة لتسخين المياه مرة أخرى بعد الاستخدام. الحد الأقصى لارتفاع السيارات في ساحة الانتظار هو 2.07 متر/أمتار. تتوفَّر خدمة تخزين الأمتعة قبل موعد تسجيل الوصول في تمام الساعة 02:00 ظهرًا. For the price you pay, it’s so good! Comfy beds, nice kitchen. And the pool and hottub were also nice! Location was perfect, middle of the city centre and right near the beach. Only ‘bad’ thing: washing machine and dryer didn’t work really good. But other than that, amazing! Soon as we walked into the apartment the safety latch on the door fell off, it smelt musky and looked dated. The size of the apartment was good and the location was ideal. I didn't want to use any of the facilities such as the crockery or cups as I just got a unclean vibe also there where mosquitoes and small flies flying around and no windows where even open for them to have got in which makes me think there where a few hiding away in corners. The spare blankets where old and torn and the beds were some what comfortable however the single bed in the lounge rolled around everywhere when you tried to sleep so you ended up in the kitchen in the morning. The WiFi only seemed to work on the balcony and would constantly go in and out of reach not ideal when trying to speak to family from home. The young girl at the front desk however was very sweet and kind and was welcoming. The apartment is in a great location if you want to be close to Cavil Avenue. Our apartment itself was old and needed work. The bathroom door was coming off it’s hinges. The washing machine needed a clean and don’t even get me started on the filthy mop!! We stayed 2 nights and we hardly slept because of the entrance door being constantly slammed. The people staying in the opposite where coming in and out til 3am and smoked in their apartment and the smell came into our apartment which was very unpleasant. 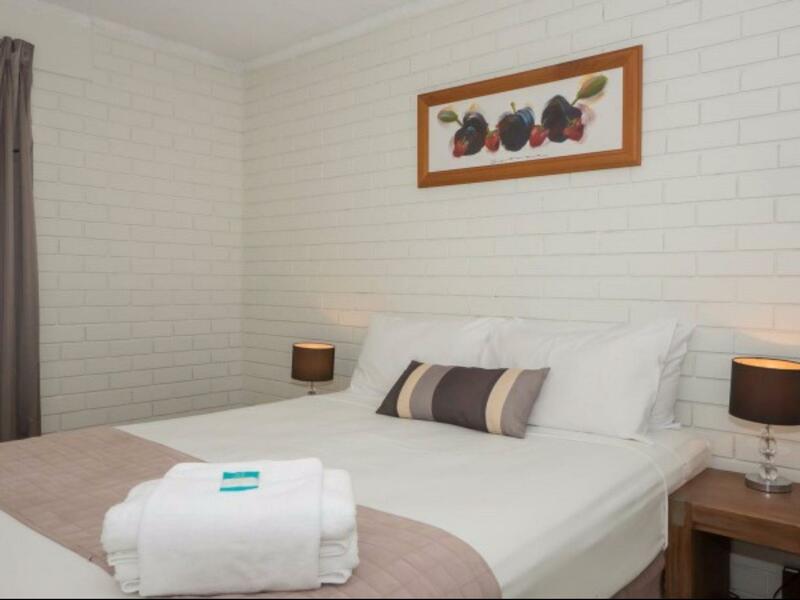 If you want somewhere cheapish in the heart of Surfers Paradise then you could stay here. If you want a good night sleep, stay somewhere else!! This place is in a fantastic location. If you don’t care about cleanliness at all, then you’ll be fine. It was dirty and not value for money. The lock on the door was broken, as was the safe. Cushions on couch filthy. Budget is fine, but this place has given up on maintenance. AFTER 6PM, ONE HAS TO SELF CHECK IN, ITS A GUEST HOUSE NOT AN HOTEL, STAFF NOT AVAILABLE ALL THE TIME, ONE HAS TO CHECK OUT BEFORE 12NOON, OFFICE GETS CLOSED BY 2PM , ONE CAN NOT KEEP THEIR LUGGAGE TOO. A place near point of interests and beach. All the facilities inside the property such as stove, dryer and washing machine are very convenient for the family with young children. Halal restaurants nearby such as Afghani Charcoal, Malaysia Food, Shiraz etc. Although the interior/exterior was quite dated it had everything we could of asked for. We had no problems with anything in the apartment and it was very spacious with a nice balcony for our morning breakfast. Overall was good value for money when we got a good deal through Agoda. Very happy customers and would be happy to return again. Great value accommodation, large, spacious and clean well appointed apartment, close to beach and Surfers paradise night life. All staff were extremely friendly and the manager was a fantastic host. We will definately stay again and recommend to all requiring a budget family friendly holiday. Stayed there during Christmas. Complete kitchen. Free parking. It felt like home. Staying at the ground floor was good. Close to Surfers, walking distance to the beach. The location is great with beach n tram stops nearby. It is near halal restaurants. Really nice n friendly staff. Supermarkets n shopping Centres are also nearby. Will stay again if we visit GoldCoast. 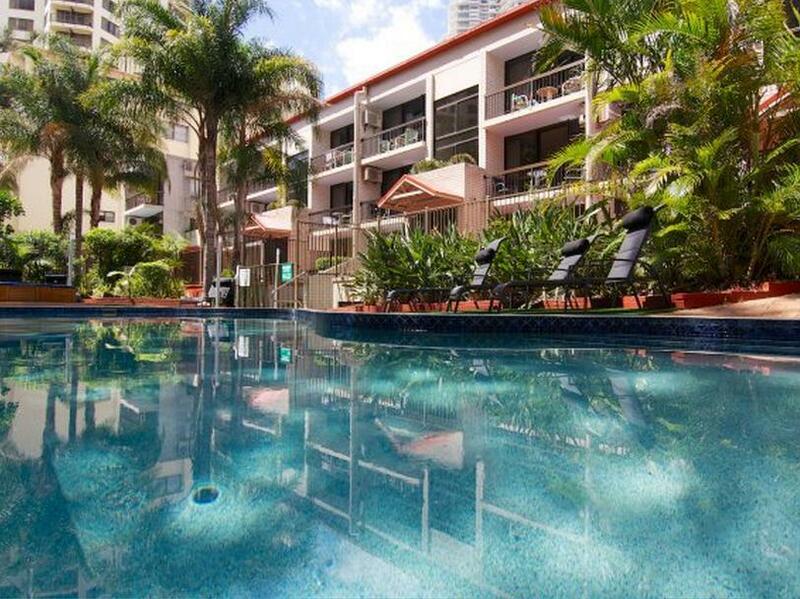 A great place to stay right in the heart of Surfers Paradise. The tram stop was a short walk away. The Cavill Mall, Q1 Tower and beach were all within easy walking distance. The staff were very friendly and helpful. We had a 2 bedroom apartment on the 2nd floor with a balcony overlooking the pool. The apartment was spacious and very clean, with a well appointed kitchen. There was a washing machine and clothes dryer in the bathroom. The beds were very comfortable. A communal BBQ area was situated beside the pool. At night, the pedestrian access gate was locked, as was the external door to the stairwell and the spacious underground car park that could all be opened with our room key. We felt very secure in our apartment. Location is gold! a lot of places to shop nearby. 24 hrs shop were around the corner. Basement parking were plenty although have to go through sharp corners to exit.beware those with big cars. Checkin was quick and so was during checkout. The pool was adequate for small hotel. the room itself was well equiped. Although i didnt mind the okd furnitures and the sagging curtains,i did find the room was quite smelly when we checkin. smell like an asian restaurant with no ventilation. you get to use to the smell after a while but u will notice it once you come back after a while out.overall,well above average. for muslim folks, a lot of halal restaurant nearby so this is definitely a place for you to consider. First time visit to Gold Coast, choosing this hotel because of its facilities including pool, kitchenette, washer, dryer and etc. Room is big and perfect location which a couple of minutes walking to the famous Surfers Paradise and shopping area, plenty of eateries nearby. Both front desk staff are helpful and provided good services during our stay. We had a wonderful stay at this hotel and would highly recommended to everyone. Great location, 3-5 min and you're at the heart of the city with many stores and restaurants. Beach is at the end of the block. The price is extremely reasonable for the convenience, free parking, and laundry machine in the bathroom (detergent not included). Bed was comfortable and lots of storage space. This place is basically a one bedroom apartment with sofa and TV. Apartment was quite clean despite the tired look, which we didn't mind since we were using the apt for basic needs. Didn't use the pool but saw kids enjoying it. No free wifi but we bought Australian SIM cards so we didn't need wifi. Very comfortable stay, but beware you have to empty the garbage bins and tidy up the place for check out. We stayed 2 nights so no biggie for us.